The first school in the mainland colony of British Columbiain was opened in Sapperton in the Royal Engineers camp (the old B.C. Penitentiary site). It was established in 1859 and the exact location is unclear. It is likely that classes were held in the Club and Library Room where the church services were also held. The school closed in 1861 when the teacher Miss Emily Herring was dismissed in March for misconduct. It was reopened in early 1863 when Mrs. Anne Moresby was appointed teacher. When the Royal Engineers left Sapperton in October of 1863, the school was taken over as a “colonial school” by the British Columbia colonial government. In 1870, the school closed and Sapperton was without a school until 1888. The second school was apparently on Hospital St. for a few years. This was followed by a school on at Fader St. and Major St. (1888-1912) in lower Sapperton. This school was at northwest corner of Fader St. and Major St. and extended between Fader St. and Kelly St. In one Goad fire map, it shows the school property located at SBII, Lot 8, individual lots 1, 2, 3, 4 along Kelly St. and 25, 26,27,28 along Fader St. The schoolrooms were large with high ceilings. There were four rooms in the main school and a separate small kindergarten behind the larger Sapperton School. The school dated from about 1888 to 1912 as a school and was used for a number of years afterwards for local groups, scouts, etc. At least part of the school and the whole kindergarten were moved and turned into houses on Fader St. These houses are noted as being on Fader St. between Major St. and Braid St. on the river (even numbers) side. In 1901, a Nursing School was founded at Royal Columbian. It continued to graduate nurses until 1978. 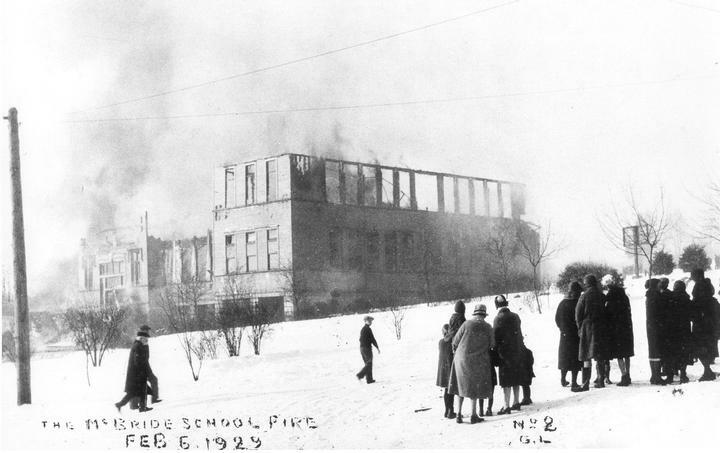 The Sir Richard McBride School was built in 1912 and burned down in 1926. It was rebuilt and still exists. There is now an elementary school near Hume Park and a private school, which is located in the same building as Knox Presbyterian Church. From The New Westminster Heritage website comes these views of Sapperton School at Fader St. and Major St. about 1912. 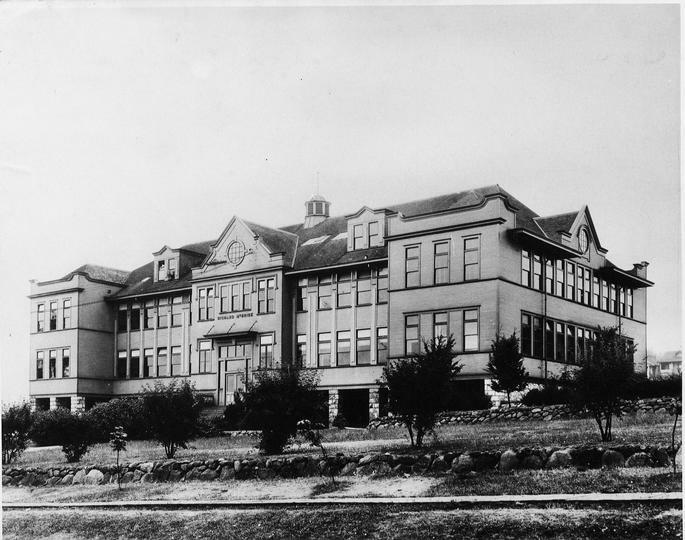 Description: This appears to be Sapperton School – the woodwork and windows suggest this, see the Weekly Columbian Sept. 3, 1912, p.12 for photograph. Ceremonies are taking place, perhaps due to the fact that a new Sapperton school – Sir Richard McBride has just been built (See Wkly Columbian Sept. 3, 1912, p.13). The old Sapperton School seen here will be phased out. The man in the rounded white collar, who is speaking at the centre of the dais is a dignitary from the Royal Visit of the Duke of Connaught. The same man is visible in photograph no. 1914 – Visits of State – which shows the ship “Princess Alice” carrying the Duke, Duchess, and Princess “Pat”. This man is 4th person to the far right on the lower deck of the ship. Another dignitary present at the school is T.J. Trapp (4th man from left – standing in the doorway, he has a white beard). At that time Trapp was president of the School Board – this is mentioned in the Wkly. Columbian Sept. 3, 1912, p.13. 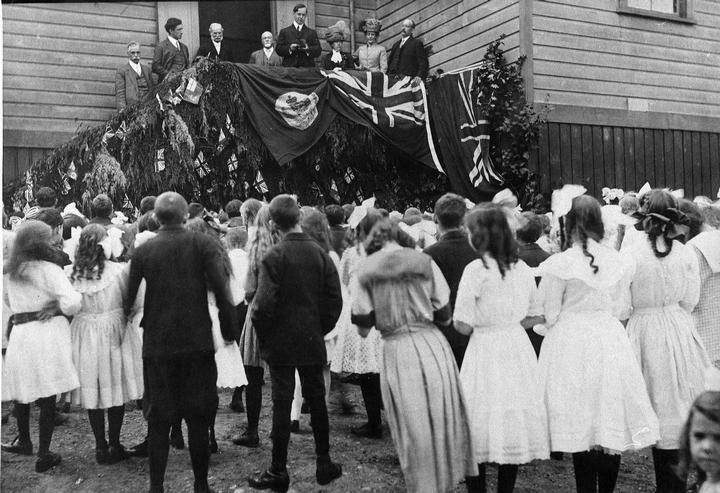 Note how the dais is decorated with flags in honor of the Duke of Connaught’s visit to New Westminster. From The New Westminster Heritage website comes this view of Sir Richard McBride School in taken on 23 Jul 1926. The school was named for New Westminster born Richard McBride, Premier of B.C., who was a son of Arthur H. McBride, the 1st warden of B.C. Penitentiary. Description: “Richard McBride School.” Built 1912 in Sapperton, burned 1929. Named for N. Westminster born Richard McBride, Premier of B.C. (son of Arthur H. McBride, 1st warden of B.C. Penitentiary). 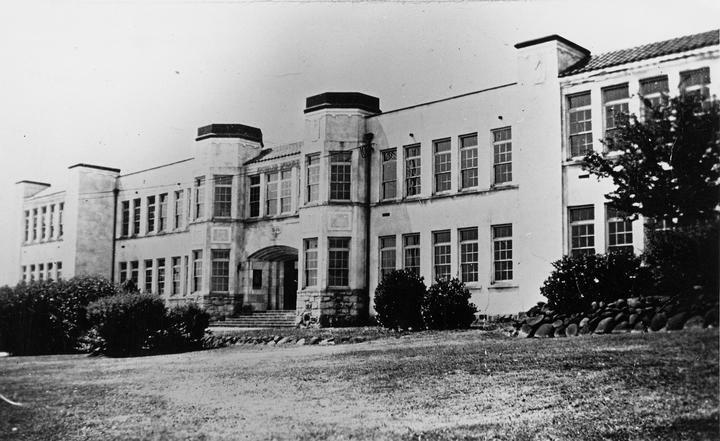 On 6 Feb 1929, the Sir Richard McBride School burned down. 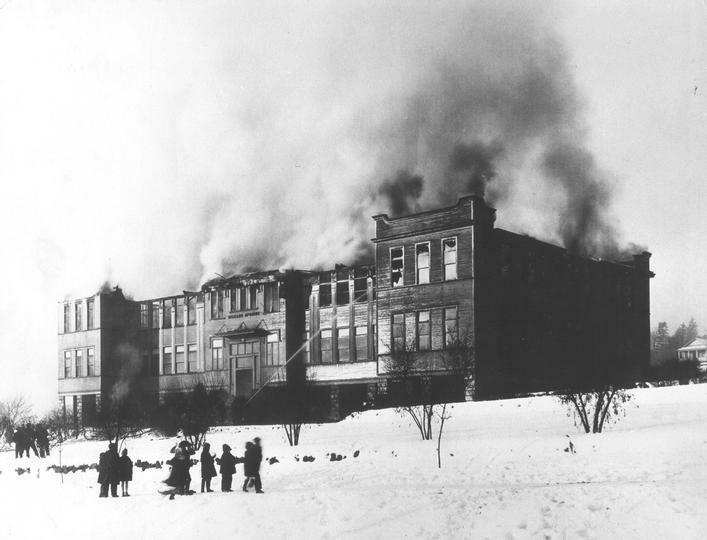 Description: Richard McBride School burning in 1929 fire. After the 1929 fire, emergency tents were constructed as a temporary measure. 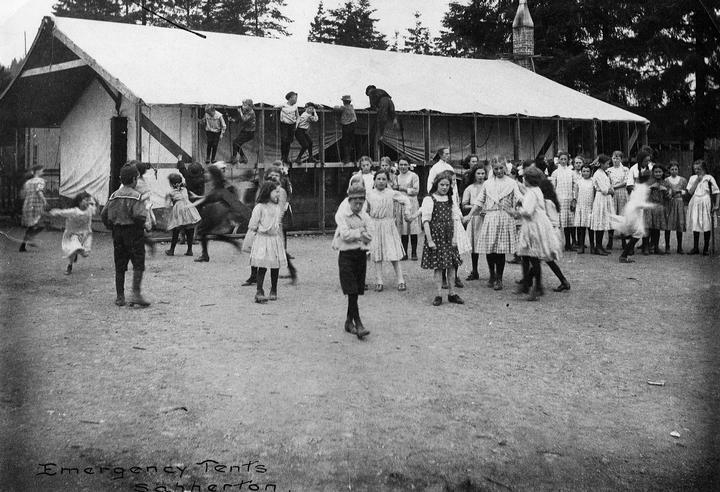 Description: This appears to be the Emergency tents constructed for the school children at Sapperton after Richard McBride School burnt down on February 6th, 1929. 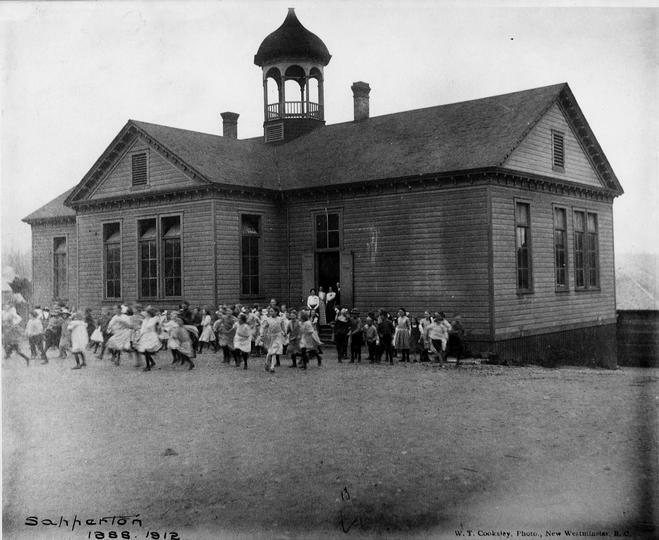 The school was later rebuilt at the same location. Description: Richard McBride School taken from the front. This photograph appeared in a school momento done for the year 1940-41. Incredible photos and I had no idea McBride had a fire in ’29. I attended this school from ’56 to ’62. I attended the original sir Richard mcbride school prior to the Fire in 1929. I remember the school burning down.. I was in grade 2. After that we went to school 1/2 days in the old gym as it had been saved from the fire. My older brothers attended school at the old New West jail while awaiting the new school building. I see one of these photos was donated by my brother Joe Plaskett, possibly the photo was taken by my father, Canon Frank Plaskett. He was an amateur photographer. I too attended attended this school from ’54 to ’61. Does anyone remember Mr. Elliott (principal)? I attended this school from 1941 .. to.. 1949. My 4 siblings did also around the same years. I have a photo of teachers on the steps. Do you want it on here? Hello former McBride students. The school will be celebrating its 90th birthday on May 25th. Former students are invited. We are putting together a slideshow of photos and are looking for any class photos you may have from the 1930s, 1940s and 1950s as well as the early 70s.